Methods: Through bioinformatics analysis, we find miR-597 is the preferred target miRNA of 14-3-3σ. The expression level of 14-3-3σ in NPC cell lines was detected by Western blotting. The expression of miR-597 in NPC cell lines was detected by qRT-PCR. We transfected miR-597 mimic, miR-597 inhibitor and 14-3-3σ siRNA into 6-10B cells and then verified the expression of 14-3-3σ and EMT related proteins, including E-cadherin, N-cadherin and Vimentin by western blotting. The changes of migration and invasion ability of NPC cell lines before and after transfected were determined by wound healing assay and Transwell assay. 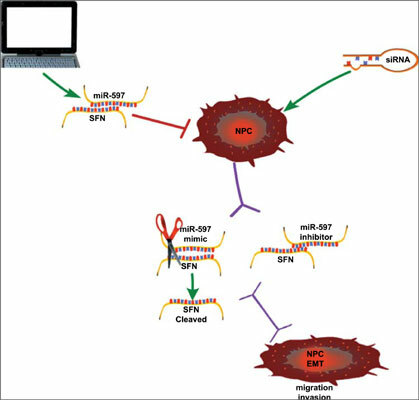 Results: miR-597 expression was upregulated in NPC cell lines and repaired in related NPC cell lines, which exhibit a potent tumor-forming effect. After inhibiting the miR-597 expression, its effect on NPC cell line was obviously decreased. Moreover, 14-3-3σ acts as a tumor suppressor gene and its expression in NPC cell lines is negatively correlated with miR-597. Here 14-3-3σ was identified as a downstream target gene of miR-597, and its downregulation by miR-597 drives epithelial-mesenchymal transition (EMT) and promotes the migration and invasion of NPC. Conclusion: Based on these findings, our study will provide theoretical and experimental evidences for molecular targeted therapy of NPC. NPC, miR-597, 14-3-3σ, EMT, migration, invasion.